I’m Oracle Certified Master and Oracle ACE Director with 7 years of experience managing UNIX- based Oracle Databases. As a working IT professional, I have experience in a wide range of mission critical technologies, specializing in database administration best practices for backup and recovery. I have hands-on experience with real-world Production environments and have risen in the ranks from a developer to a managing DBA. Currently I’m working at AzerCell Telecom as an Expert DBA and serve as a lecturer teaching Oracle Database Administration at Qafqaz University. i am impressed by your remarks for my question in oracle forums. i am just about to be graduated. can please help in guiding my career in your foot steps. i am also very much instrested in working on oracle. i am currently preparing for ocp fundamentals exam. lokking forward for your reply. xarosho shto u tebya uje est OCA i OCP sertifikat… nedeyus u menya toje budet skora, no poka ne dumayu..
Oooo Privet Orhan. Kak dela? Mashallah vidno shto russkiy ti otlicno znayesh That’s perfect! 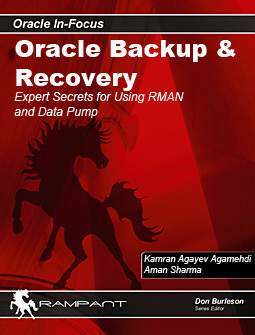 I need the links for Books on RMAN backups and on Datapump. And i need some critical scenarious which we face as DBA. hello kamran. i want to learn oracle and start a career as dba. i am a rhce. but am confused which exam i will go for. will i go for 9i dba exams or 10g dba exams particularly. and there is also 11g. plz advice me which way to go? i also want to learcn rac. and another q, is it necessary to learn pl/sql if i work as dba. thx for this wonderful blog. i have completed installing 10g on centos 5.3 using virtualbox v3. thx a lot kamran for ur suggestion. i will surly start from oracle 9i. Salam Kamran muallim . Man ozum Java proqrammistam . Lakin hala hech vaxt Oracle-la islamamisam . Esasen MySQL -le ishlemisem . Database-ler haqqinda yaxshi melumatim var .PL/SQL-i ise bilmirem . 1. Siz mana hansi kitablari maslahat gorerdiniz ki baslayim oxumaga ? Bu berede kitablar coxdu. En tovsiye etdiyim kitab, “PL/SQL by examples” kitabidi (fourth edition). Web-den pdf versiyasini tapib oxuya bilersen. Basically I m pursuing BE Computer Engg. , and I have lot interest in Database, Datawarehousing & Data Mining. I want to pursue my career in DB Administration or Warehousing. Q.1 : Is BE + OCA sufficient for starting career in databases ? Or are there any other courses that can help me get into Dataware housing ? Q.2 : What is scope as fresher ? What things I need to consider for getting entry level job as junior DBA ? Thanx for ur help in advance. I think that you’ll start your Oracle career as a Junior DBA. But one thing should be mentioned that administering VLDB (Very large database – data warehouse) and OLTP systems are different. So you need to make a decision for that. Just one more thing…can u suggest me some books which can help me for practicing at home as I have opted for self-study mode…. Or should I continue with certification books from oracle press ? You are simply impressive. May Allah bless you more success in life. Iam a newbie to oracle 10g,i want to make a career in dba and dba most imp job is to keep the data secured and available,sir can i refer your book “BACKUP and RECOVERY”..
Salam Kamra mlm. Seminarda verdiyiniz kitablarin adlari ve sertifikat ucun gosterdiyiniz addimlar cox iwe yaradi. En azindan indi haradan bawlayib haraya gedeceyimi cox yaxwi bilirem. Bunlara gore cox sag olun. Kamran mlm sizin dediyiniz kimi exam topics print etdim. Ve 2 Day DBA oxumaga bawlamiwam. Artiq 60 sehifeden cox oxumuwam ve demek olar ki oxuduqlarimi anlayiram. Sizce men exam topic deki movzulari bawdan bawlayib axtarim ve oxuyum, yoxsa 2 Day DBA deki topic ardicilligini izleyim?. I recently happened to come across your Blog , Your effort is a source of inspiration & quite helpful for newbie like me seeking career as an Oracle DBA. Ma’sha Allah..
Bugun Oracle Ace oldugunu ogrendim, cok sevindim. Basarılarının devamını dilerim. how in the world are you able to obtain multiple Oracle certifications, author books for Rampant Press, teach Oracle admin courses, and pursue a PHD? You are definitely an inspiration for me. Man, you can speak 5 languages. Too Good !!! Nice to know you, i’m from indonesian. Would you like to help me…I have problem with my oracle database. My Server harddisk was broken but i can recovery the data back. I have installed new OS and oracle 10g in new harddisk. Can I replace the datafile with my old datafile ? I have no backup for system01.dbf datafile. Can you give some information to fix it ? I am an experienced DBA and happened to see your blog. Amazing how you keep up with the blog, authoring a book and pursuing a PhD. Inspiring indeed! Keep up the good work. i am currently preparing for DBA 9i sql, fundamentals exam. is it important for dba’s to analyze projects and creating db logical design for projects.. i am getting problem for creating tables for projects…and normalization also….is it important for me…i am doing 10g ocp..i like to work in oracle….reply me soon. Salam Kamran bey. Size bir sualim var. Neye gore bizim sizin kimi, Teymur Haciyev ve digerleri kimi Oralce uzre mutexessislerimiz ola ola yerli kurslar xaricden mutexessis devet edirler? Mence onlara az pul vermirler. Hemin pulu bizimkilere versalar(meselen size) daha yaxsi olmaz? I hope you’re well. Is there any chance of you modifying your WordPress settings so that your full articles show up in the feed? This can be changed in Settings -> Reading -> “For each article in a feed, show”. Thanks in advance for considering it. I show your Vidio Tutorial and it is very very useful. Thanks for sharing. I request you to please share a vidio tutoria for Performance Tuning. After seeing ur blog, i was really impressed, i worked in various platform(Sun solaris, Suse linux,IBM aix) and also different version of DB, quite played some Developer role as well. But after seeing ur blog, i am changed my mind to do only core DBA activity. Need more posts of the real time scenarios from side will help all our DBA community. my heartful thanks for ur great effort and best wishes. I’m very happy that my articles are helpful! Thanks for feedback and wish you every success in your DBA career! Excellent work n experience keep it up !! i am completed oracle 10g ocp certification.now i am looking for a oracle 10g dba junior jobs in dubai-uae.how to get the jobs and how to prepare for the interview. The Book which you are writing Now. When it will get released????. The release date for this book is July 2011. I am waiting for this book since last 6 Months. i am Riaz and i am working as an Oracle DBA and Trainer. i am 9i,10g,11g OCP now i want to give Oracle OCM. I could resolve many of my oracle admin related queries through this blog. Nice efforts. and i had installed OEL4 in VMWare and i am trying to connect through putty ..
i am not able to connect its giving error. network error. Aswk Sir, MAY ALLAH give you more Knowledge to share with us . I am very glad about your Achievements . I am trying to learn Oracle DB completed OCA(10g) & waitng to be OCP. Sometime i loose my confidence becz i am not getting job in this field mean want to work on Real project. Will you tell me how we can create more than one instance ? Pray for my Career in Oracle DB. Will wait for your Suggestion for my Carrer in Oracle DBA. I want to become OCM. Happily I would like to let you know that I am authoring a book on Oracle 11g Advanced PL/SQL concepts with PacktPub publishers. I would like to seek your help in reviewing process. I would be happy if you could extend your support in this regard or refer somebody to carry on the content reviewing task. I shall be obliged. I have recently completed my ORACLE 10g OCP certification training.And my exams for certifications are going to be completed in next week. I have referred you blog and I found it very much useful for a newbee or an experienced DBA as well.It is very much helpful. I think these will be very much helpful to all DBA persons to learn something new about the Backup and Recovery techniques. I want to know something about how to take backup of recovery area into tape for disaster recovery.I have watched the video provided by you for Disaster recovery for disks.I also want to learn about: disaster recovery of the backup we have taken. If you can provide some good material or a video for this so that I can get some idea.And It may be helpful for others as well. Thank you for hearing from me. I want to find out session details which are log in and log out since last 4 hours without auditing enabled ?? Can I do this thing?? This is really helped me alot. I really appreciate your help. online ,shipping charges will be more than cost of book. i have configuring data guard so many times.but log shipping is not happening.can u please post a video on configuring dataguard on rhel4. quel conseil ou remarque avez vous a me donner? merci g compte sur ces compte, c est important pour moi. I would suggest you to start reading OCP related books, read Oracle documentation and perform practices. Install virtual machine, install Linux+Oracle and start practicing. This is the best way to become OCP. If you would like detailed advice, ask your question in more details. u have asked me 2 add database information to listener.ora file.what information i have 2 add. I heartly thank u for supporting us to learn and understand the topics by provinding videos and doc’s. I have followed your document to configure 10g RAC database on vmware server(linux os).I have followed with same i configured succesfully with 2 nodes. I want to add another node to existing RAC database.will u please provide steps for adding node. I have tried with OUI i got error OUI-35000: Fatal cluster error encountered.Please help on this. I also want to upgrade 10g RAC to 11 RAC database please upload document sir so that we can upgrade my rac database. but its not working for mail,however incase of file it works fine.. Please point out any suggestions.. I want to learn about expdp and impdp. I do able to perform the expdp of a particular database of one host and when I try to imp into different host it’s not importing. Do I need to create those Tables of which I took backup, into the database on another host. Although I’ve followed some links for exp and imp bt still no luck for now.I’ve very much confused. Plz guide me.If you have any video tutorial then it would be great help. This is praveen.i was trying 2 create cronjobs.As a root iam able 2 run cron jobs.But as oracle user iam not able 2 run.plz advice me the best possible way 2 execute cronjobs as oracle user. I would like to purchase this book in India but i could not find it. From where i can get this book as from rampant-books.com it is too much costly 108$. I am anurag kumar b.tech graduate in computer science since working as web-application developer from 2010 .
currently start oracle dba course give me right guidelines for a good dba . How can i get this book in India. I tried to buy this book online from rampant’s official site but shipping cost was more than cost of book. Your site is fantastic. Its great that you are able to share so much valuable knowledge. I need some help in installing 10g on Virtualbox running OEL 5.8.. Pls would you contact me, many thanks. Hi currently i am working as a Application developer in php i want to switch the job to Oracle filed so please suggest me which one is better field Oracle DBA or Oracle Application Developer for 10g. I have 1 year experience in application developement,i want to become a good oracle dba . I am very much interested in Backup & Recovery,So please suggest me some book for the same which should be near by your books topic until your book release in India. Could you let us know when your book on backup and recovery will be released in India. I am very much interested in that book as I am just started focusing on the backup and recovery part. First I like to Thank you for your nice and useful blogs. I working in IT but did my graduation in Biotech. I am a beginner in ORACLE. I have got a assignment to call a unix shell script from ORACLE Procedure. Configuring rac step on vmware by using your document. another machine.both the servers are running in widows,oracle version is 10gR2 . please send me the step-by-step procedure. It’s very simple. Why you don’t want to try it by your own? This is KajaMaideen from India, I am jobless and searching job in java, j2ee, jsp , servlets, . And i have knowledge on db and sql. I am struggling for an entry, Kindly if you can help me out from this and it would be really great full to my efficient career start. I can prove my worth also. Excuse me, I have a problem, with oracle 10gr2 install on Linux Centos 5.8 (i386). Thank you with help me. Is it a virtual machine? Can you please publish a blog post about your experience and feedback during the review of my book? I shall be thankful. Have you tried http://www.oracle.com and checked the Download section? i’m proud you, hopefully you will pass everything successfully. I am waiting for so long but still not available in India. I have good experiences about Oracle Database Administration and I read Oracle books from Oracle Library and Oracle Press. I want to be professional like you but I think my knowledge is very erratic. Can you help me in this way please? I was wondering if you have steps to remove instances from RAC in ASM environment without using DBCA. I want to ask something that is there any website where i can do my DBA practicals? Because i am not able to afford to purchase a new pc or a laptop.And i am studying with my self. I read your blogs and i gained more knowledge about the oracle problems that are genearly occurs. and any link if you have where i find more knowledge about OCA so please tell me.And also please tell me is there job in north India? I will be thankful to you. Salam Kamran muellim.Oracle-ya sifirdan bashlamaq uchun hansi kitabi tovsiyye edersiniz? Do you have any format to answer this following question, if not, then from where i can get an idea if anyone knows please reply. Please answer the below questions to be able to proceed with proper sizing. – Existing Applications/Database, cluster type and software version. – Number of users and concurrent users. – Network connectivity for the exiting environment and for the new environment required in terms of connection speed (1Gb or 10Gb) and type (UTP & fiber), note if fiber is required then we need to know whether long-range (single Mode) or short-range (multimode) is required. – Any special requirement for the new infrastructure. – Migration services whether it is required or not. If you have any standard just please let me know. Salam Kamran muelllim.Oracle 11g OCA imtahanini vere bilmek uchun Oracle 10 imtahanindan kecmek mecburidirmi? Is there anything that needs to be taken care in this ? I am from India , & in my country this book is not available. I am going to paris and germany in the month of March 2013. Could you please confirm that this Book is available there or not, so that I can puschase it. Please suggest me good books or documentation for understanding relational database concept in details.I am programmer wanted to learn database concept. Inshallah Sentyabr ayinin sonu ucun boyuk ehtimal USA-e Oracle OpenWorld konfransi ucun gelecem, imkan etsek mutleq gorusek. Sentyabrin ilk 15 gunu bakida olacam. Inshallah sentyabrin sonu Amerikadayam. hello sir, i am Govind from India. I am trying to install oracle 11 g release 2 on Ubuntu 13.04 64bits, But there are many errors (around 12-13) like ‘error in invoking target ‘client_sharedlib’ of makefile’,error in invoking target ‘ntcontab.o’ of makefile , etc. m tried many times but am not able to resolve these errors. This is Govind from India. I am trying to install oracle 11g release 2 on Ubuntu 13.04 64 bit. Everythings are going fine till 68% and then there are 11-12 errors like error in invoking target ‘client_sharedlib’ of makefile. I have tried many times but m not able to resolve these errors. please guide me sir. congrates for your OCM certification. I’m working as Oracle developer for last 6+ yrs (Pl/sql, forms/reports), now i want to learn Oracle E-business suite. Could you please suggest, how can I learn this in Dubai. it is very good website indeed. i am newly oracle 10g dba (ocp). as i am fresher so i can not get the orcle Dba job. now i am confuse what i have to do and how ??? please help me. it is my lovable field and i want my career in oracle Dba but having no guidance. First of all congrates for your OCM certification. I am using the correct bit version. And can you send me any link where i can read more information regarding passwordfile( Remote_login_passwordfile = shared) because i want to implement it. Thank you sir in advance. Good day Sir, im so impressed with this blog, may d Almighty increase you in knowledge. Thank you. Thank you for the feedback my friend. Appreciate! Plz Kamran sir give me some follow up of my previous mails. data guard (Primary to Standby).I feel that it is very useful for us. I love to read your oracle blog and video tutorial. I bought his book on RMAN on Amazon, has not arrived yet, but would like to get more experience on RMAN. 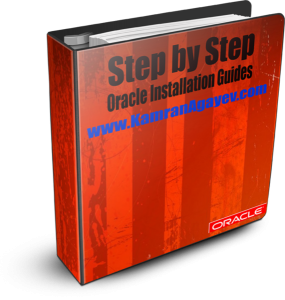 I want to download oracle 11gr2 software on my ubuntu 13.04 version Operating system in my desktop can u send me the step by step process how to download ……. I am studying oracle and I am ready for taking first oracle exam. But I am lite worry because I do not have programing background and I think I need more hands on practices, Do you have any recommendations. Have you checked my OCM journey blog post? Your blog are very interesting and full of knowledge. Sir,pls post some thing related to DATA GUARD. I read your blog its amazing work you did. Could you please help me in setup Dataguard. Can you revert over my email ..
All you need is to start sharing your experience and learn “how to start blogging” techniques from google. Can you please share some details about this blog. i.e. what is size of this blog? how much you pay yearly? which is the best site to but domain? Need to go through ASM concepts in depth also the grid installation of 11gR2 on single standalone machine and Rac concepts. 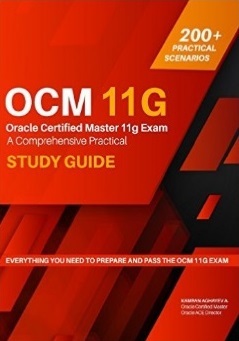 I am eagerly waiting for your new book “Study Guide for Oracle Certified Master 11g Exam” and I can see it will be on Amazon on 1st January 2016. Kindly let me know if it will be available on time as I have planned for the exam in February 2016. My email is included in the “Leave a Reply” section of the page. salam Kamran bəy, təşəkkür edirəm bu şəkildə yararlı blog yaratdığınız üçün. I have ordered your book Oracle Certified Master 11g Study Guide through amazon.com on January 10, 2017. Order number 107-1388714-1763462. I ordered it from Maldives. Estimated delivery date was Feb 23, 2017 – Mar 15, 2017. I still didnt get the book. Even I do not see the contact seller button when I check my Orders. Please can you support me to track the package. 1) Which software program is essential for my occupation? 2) Which course is recommended by you? Dear Nigar x. Thank you for the comment. Practice according to the contents of the book. Should I test it with 11.2.0.1 version? Hi Jae. Thanks for purchasing the book. Good luck with the exam!